If you thought Baku is the beginning and end of Azerbaijan, and that I was done talking about my weeklong trip, you were soooooo wrong! Seven days is long enough time to tuck several experiences under your belt. And if those days are spent in a country like Azerbaijan, it is sufficient time to explore more than just the capital city. The first two days I spent in Baku made me realise that the city is the perfect canvas to showcase the wealth of a growing economy. With its sky touching towers, modernesque buildings that share boundaries with structures from bygone eras, the city has a rather glitzy vibe. The vibe does not extend to the rest of the country. Wholesome, earthy, gritty, rustic, quaint are just some of the adjectives that come to mind when describing the people and landscape of Azerbaijan. This realisation struck me on the third day of the trip to Azerbaijan when the elder sister Raka, and me, hopped into a taxi for a ride to Gobustan. The day’s plan was to visit ‘Gobustan rocks’ and the ‘fire temple’. Those are the instructions our hosts had passed on to Elchin, our driver of the day, who thankfully spoke rather fluent English. That, my dear friends, is a boon when you are travelling outside Azerbaijan’s cities. The number of English-speaking people in the Republic of Azerbaijan is minimal. Gobustan or Qobustan is a diamond mine for those who like the rustic and are not afraid of a little sun and dust – this land is where you walk a long stretch to reach the Gobustan Rock Art Cultural Landscape Reserve, among the rare places in the world where a dizzying number of rock carvings and petroglyphs have survived the ravages of time. The road to the national reserve, walk or drive, this is one long stretch. This national reserve got its name etched in UNESCO’s World Heritage Site list in the year 2007; this has led to an influx of tourists, including buses filled with school children who prefer to spend time in a the rather well designed Gobustan Nature Museum. An interactive and informative exhibition, the museum is the ideal first stop to gather information and understand more about rock carvings before you head up to the rocks. or just animals. These rock carvings date are nearly 5,000-20,000 years old! Raka and me with our lovely guide whose name I forget. Alternatively, you could do what Raka and I opted for. Shell out a few extra mannats, the local currency, for an English guide who will walk along with you. Why does the guide work? Because it was our guide who helped us spot all the etchings – prominent and otherwise – as she explained the significance of the carving, helping us distinguish between human figures and animal figures. And dancing women! The musical stone at Gobustan National Reserve. Do let me know if you manage to get a tune out of this one! These hollows could have been used to cook or for water storage. The ‘lion faced rock’ that overlooks a vast stretch of plain land and the sea. And yes, she was the one who ensured we posed on the ‘lion face rock’ for a photographs and try to create some music on the gaval dash (musical stone) at the national reserve. Scorching sun and sweltering heat are worth the awe that will strike you as you clamber over the rocks and peer at the rocks trying to decipher the etchings. 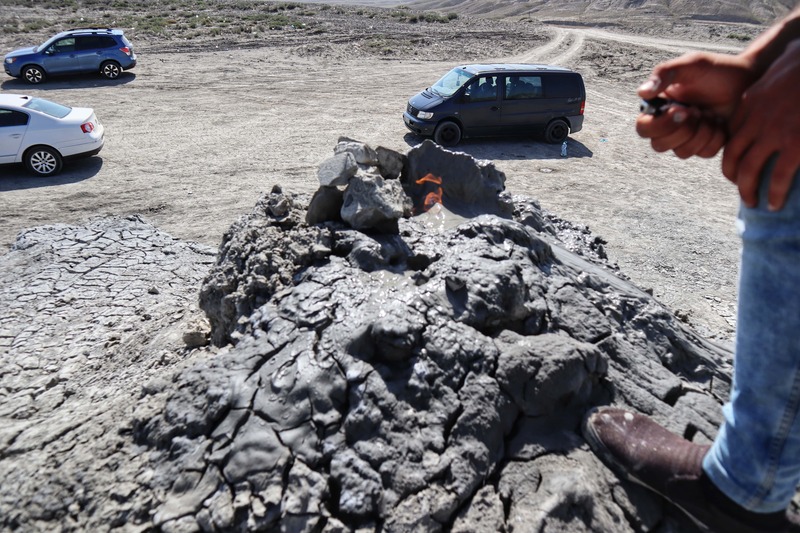 Most people come to Gobustan to visit the national reserve, unaware that a detour on the return route and a bit of haggling with a local taxi driver could lead them to the spectacle that is mud volcanoes. What are mud volcanoes? A mud volcano is formed when mud, water and gases erupt and settle to form a mini volcano. The road to the mud volcanoes of Gobustan is teeth rattling and unnerving, the vista a harsh reminder that while Baku is the glamorous cover page of the magazine, the inside stories are not as glamorous. Dry, uneven and barren land sans a proper road, dotted with sewage lines and garbage dumps, has forced locals to migrate to other parts of the country. The empty houses that you will see as your taxi rattles and jumps over these uneven roads are a heartbreaking contrast to the vibrant scenes of Baku. Oozing mud, drying and layering are a constant process. But the site that meets you at the end of this journey is enough to wipe out all other thoughts from your mind. A vast land covered with grey cracked soil that rise up to form mounds – some as tall as 5 to 6 feet – with hollowed tops where you can see the mud bubbling due to a combination of hot water and gases. Intriguing and exciting enough to have me hopping in delight, it prompted the local taxi driver to do a magic trick where he flicked a cigarette lighter at the mouth of one of the volcanoes! There was fire! I kid you not! Check out the video and you will know what I mean. Kindly ignore the strange noises we are making. A little further down these mountains is a fairly big lake which is a hot water lake. This is also where I almost fell flat on my face having failed to realise that the base of the lake was gooey mud that sucked my foot in. How I wish I had carried some empty bottles with me – I could have filled them up with the mud and used them for some beauty treatments. While two adults settled down, their feet in the water, a kid fell in and got stuck! Whew…. Did I tell you that the mud volcanoes of Gobustan are among the approximately 400 such landforms in the country, making it the highest in any region. In fact, the biggest mud volcanoes in the world – Boyuk Khanizadagh and Turaghai – are located in Azerbaijan! The volcanoes at Gobustan, however, are the most accessible and should definitely be your travel list.